I receive a lot of emails and questions about my skincare. 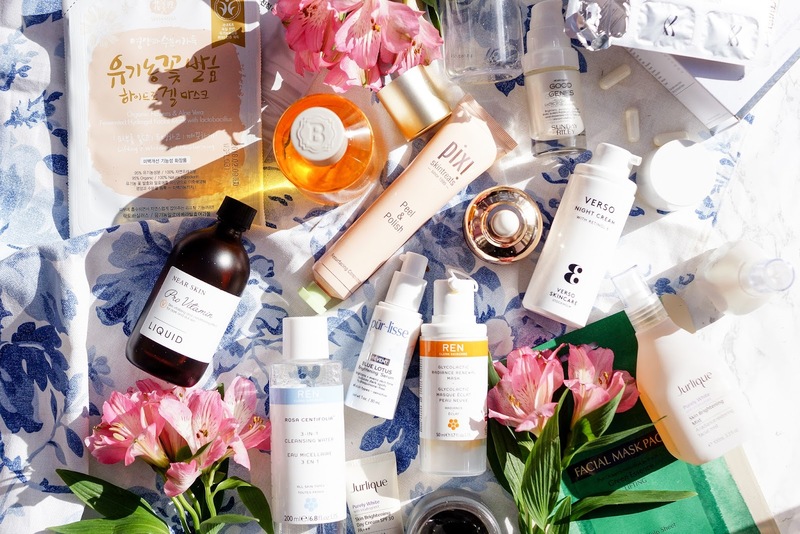 About Korean skincare, about the products I'm currently using, new favourites, old favourites, all time favourites (!) 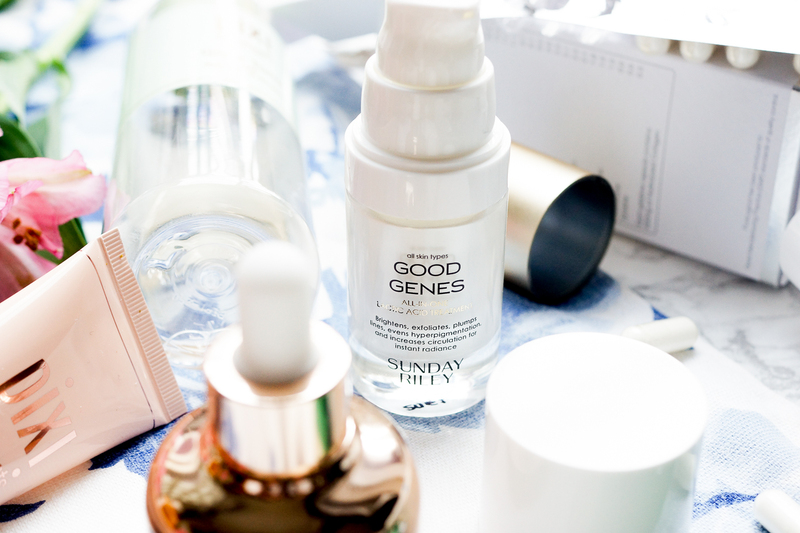 so today I wanted to throw together a skincare post to try and address some of those questions and just have a bit of a skincare chat with you (and a lengthy one at that!) - I hope you enjoy! I'm often asked what my very favorite sheet masks are, because there are countless to choose from. It's a tough decision so I'll narrow down to 5 - the Whamisa flower masks, the Blossom Jeju masks, Innisfree Madecassoside for an affordable version, Blithe's Abalone mask and the TCFS Egg masks. The Whamisa sheets are hydrogel masks that have so much light, floral essence and make my skin feel so hydrated and fresh and revived, they're the perfect mask to try for Spring. I was kindly sent some boxes by my Korean family after my initial review but you can pick them up here in the UK from Buttermilk Skincare. This micellar water ticks all the proverbial boxes for me. I'm not really sure how useful it would be to say how well this removes makeup, because I would never just cleanse with a micellar water like this if I wanted every last molecule of makeup banished. Micellar waters for me are more about the experience. I want it to look like my makeup is gone, I want to feel cleansed and fresh without having to encounter the undignified splashing my face with water scenario. And I want them to smell nice, which I feel is REN's main selling point with this product. It smells divine - of a glorious June garden, heady with rose. It's been a good 7 months since my original review, so I wanted to check in and let you know that I'm still using and loving this 15 second exfoliating treatment. If you're wanting speedy and significant results, and baby soft skin, then I'd really consider looking into this lactic acid liquid. I've actually been enjoying using it out of the shower, where I'll soak a cotton oval in water and dispense 3 drops of the splash mask and smooth over my face like a toner. I love the apothecary style packaging, let's just start with that. 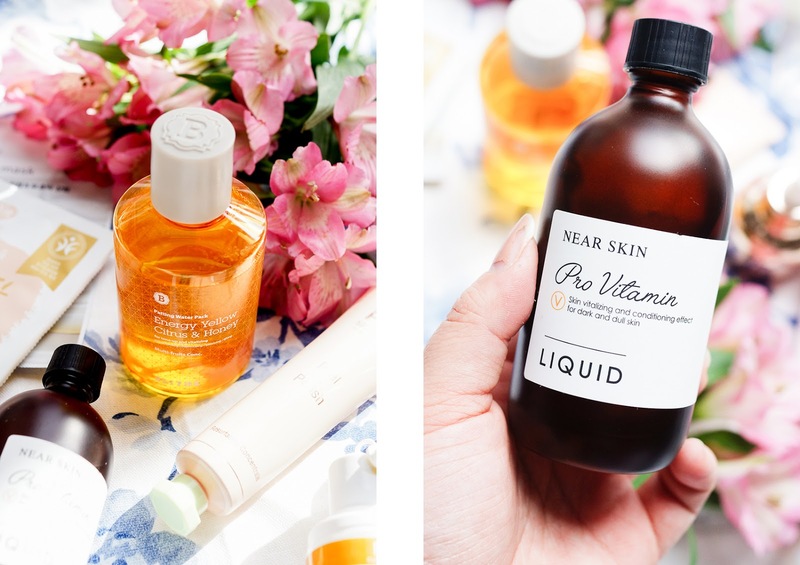 The Pro Vitamin toner is one of the skin-softener-style toners I talk about in this post, and I think we should just go straight to the point and say this liquid makes my skin feel really soft. 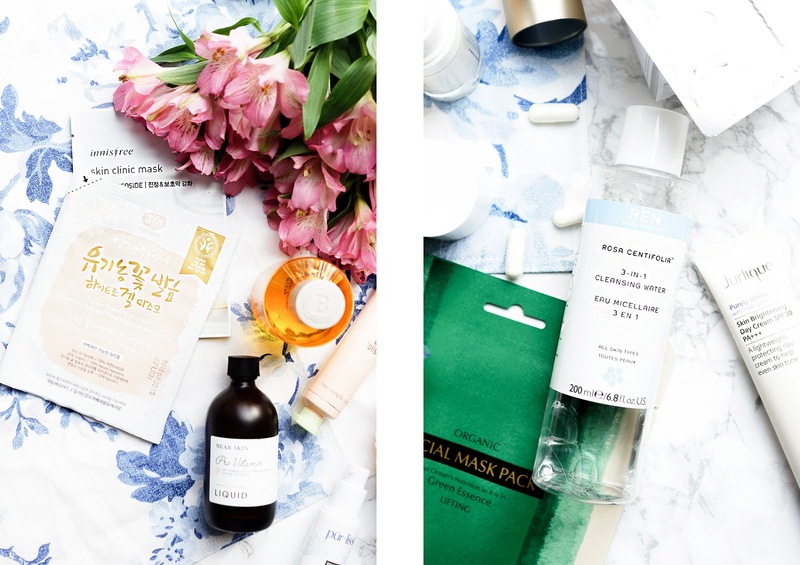 It doesn't have the world's best ingredients list, as it includes alcohol, so if you're looking for a similar product that does have the best list, try the Whamisa flowers toner. But this stuff just somehow makes my skin feel baby smooth, so I can't help but love it. I do adore these thicker toners as the weather warms up because they're so light and hydrating in texture, and comfortable to wear day or night. I had a big hiatus with exfoliators last year, particularly the physical ones - scrubs and the like, but I've felt more recently that my skin needs the occasional scrub and massage to bring it back to life. 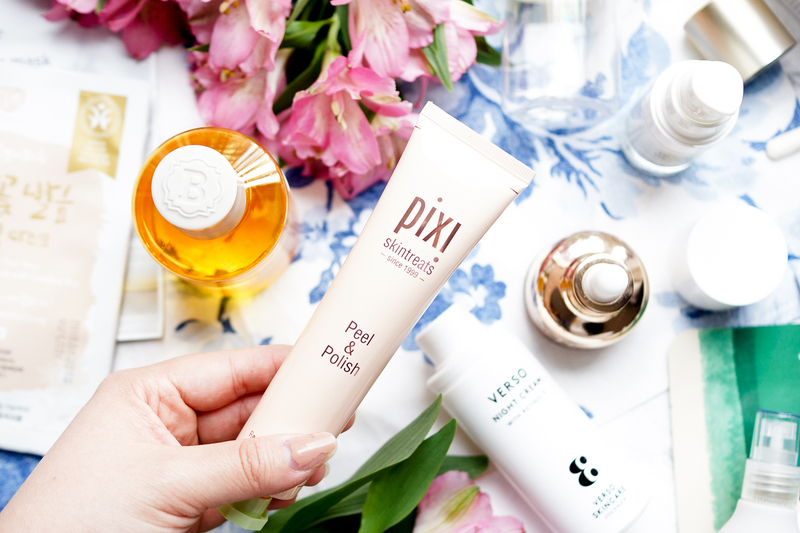 This need happily coincided with the release of the new Pixi Peel & Polish, an exfoliating cream that both chemically exfoliates with lactic acid and fruit enzymes, as well as including small particles for a manual exfoliation. In my eyes, this is a bit like the Elemis Papaya Enzyme Peel and Laura Mercier Face Polish combined (both of which I love), the idea being you apply as a mask, leave for 5 minutes to allow the acids and enzymes to lift dead skin, and then gently massage to exfoliate and renew. I wouldn't recommend this for very sensitive skins, but for my vaguely normal skintype, it's proving great so far - my skin feels lovely and soft and smooth after use. I feel I have a love-hate relationship with this product. It's a cult classic and a blogger favourite, that's unarguable, and when I first tried it, I really enjoyed what it did for my skin. However, as the months passed, I fell out of love because I just didn't feel like it was continuing to benefit my skin the way it once had. I recently tried it again and am enjoying using it post-cleanse once more, although no doubt I'll be back in six months time with a different update! Not strictly skincare but for the effect it's had on my skin, hair and nails, I had to talk about it here. 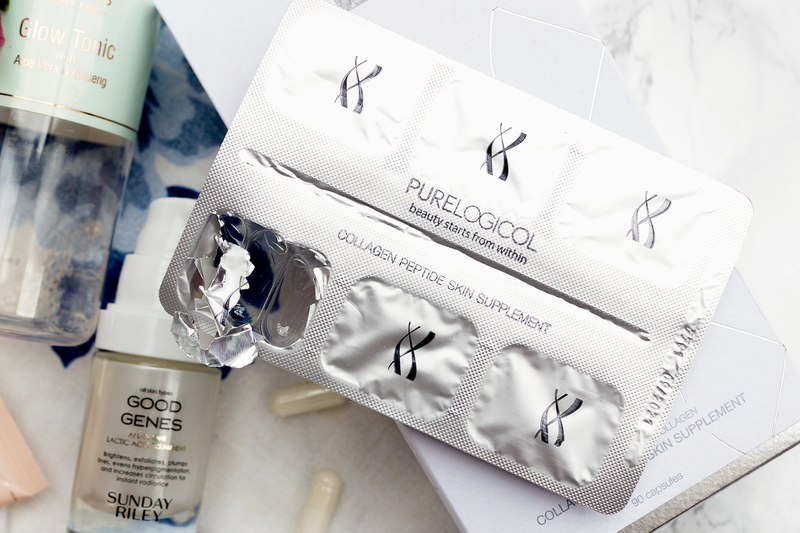 After loving their peptide cleanser (more here) so much, I jumped at the chance to try Purelogicol's collagen supplements. I'm sure you've all heard of the collagen drinks available from other brands, but I just can't bring myself to justify the spend, at over £2 per day, if it's something I need to be continuing indefinitely. These capsules contain 600mg of hydrolysed collagen (you're supposed to take 3 a day so 1800mg altogether), alongside 18 amino acids (proper list here). I've finished a month's course of these tablets and I'm happy to report some positive changes. It could well be the lick of sun we're having lately but my skin feels and looks clearer, and brighter, and more glow-y. And there's less fallout from my hair, and my nails are noticeably longer and stronger, which coming from the person whose nails have a habit of breaking and flaking, is a big plus. They say good skin starts from within so I'm hoping, along with a good diet and water etc, that I'm on the right track. If I had to choose a select few Korean skincare favourites then this essence oil would absolutely be among them. It's such a beautiful product. You get the moisturisation of honey and oil but without the stickiness or greasiness usually associated with them. Light enough to wear during the day, I've been utterly loving the combination of my Yuripibu essence, followed by this, followed by sunscreen (I've currently gone back to my O Hui because I love it) and that's the perfect level of hydration and moisturisation for my skin. They leave my skin so soft and plump, and are a wonderful base for makeup. 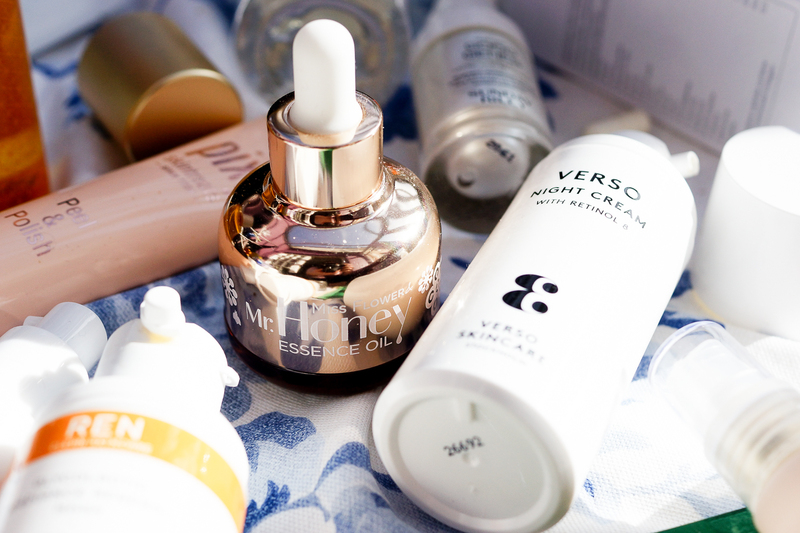 The Verso day and night creams are some of my very favourites. They're such a gentle way to use retinols, and haven't irritated my skin in the slightest, or caused it to be dry or flaky. Perhaps against the grain, their night cream is much lighter and more fluid than the day cream, which makes it perfect for layering into an evening skincare routine, and will no doubt be great as the weather warms up - I for one am not at all keen on heavy creams and moisturisers in the spring and summertime. If you're looking for a good retinol product, then I'd certainly recommend these. 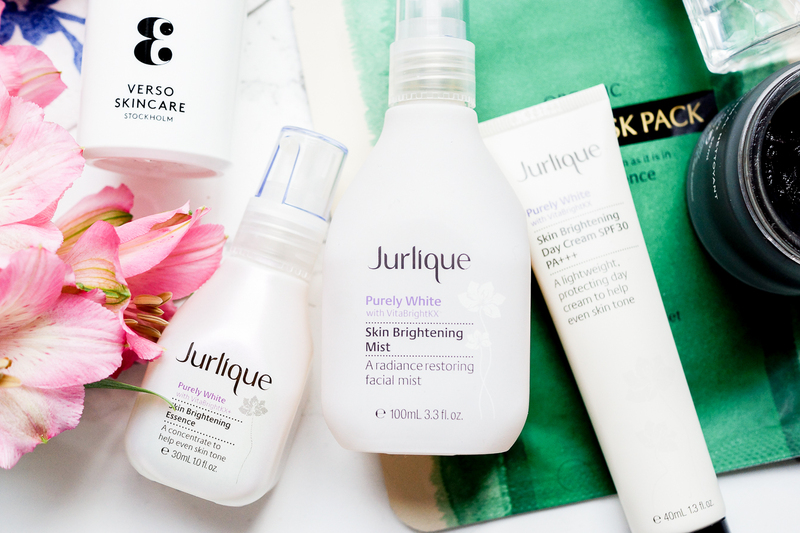 The next few items I'm able to share with you c/o Jurlique, starting off with this facial mist. Truth be told, I own far too many facial mists but then again, I'm always happy to add a new one to the collection ;) particularly if they come in frosted glass bottles as this does. It's made almost exclusively from botanical extracts, from satsuma to daisy, to lichen, to clover and has a faintly sweet, meadow-like scent. I've always been tempted but ultimately put off by their Rosewater mist, as alcohol is listed second in the ingredients list, but I feel the Skin Brightening mist is a more elegant formula perhaps, and more suited to my skin. I really enjoy how it feels on the skin, very fresh and hydrating, and my skin feels noticeably softer after use but with absolutely no residue or stickiness - that's what I enjoy most about a good facial mist. And the pump is as fine as you like, something which is in fact a big consideration for me! I do think serums and ampoules are perhaps my favourite element of skincare so I was excited to try this new essence, which promises brighter, more even skin - my skin goals! I'm happy to see niacinamide, French rose, licorice and willow bark in the ingredients, all contributing to brightening, and good hydrators like squalane and macadamia oil. On the skin it feels delicious. Scented similarly to the mist, and there's a touch of slip and slide that makes application a pleasure. It absorbs really readily too - I'm thinking that the combination of mist and essence is going to be a summer staple for me when it becomes too warm for me to bother with a full and lengthy skincare routine. I've already been trying this out for a few weeks and it's showing pretty good results with regards to brightening, yes all over but especially on my hyperpigmentation/blemish scarring. In short, I'll keep you updated but I'm so far impressed. The final Jurlique product I have to talk about is their day cream and I'm quite sad to share that this one didn't really work out for me - but the good news is, that it still might for you. Effectively a brightening sunscreen, this includes SPF 30, which I think is sufficient for everyday wear, and promises to help with dark spots and discolouration. I have found that this takes down redness quite well (I'm going to attribute that to the marshmallow that's fairly high on the ingredients list, alongside other botanical extracts) and there are lots of natural brighteners like rose and licorice, but I found the texture too drying for my skin and a touch chalky, so I wouldn't recommend it for dry to normal-combo skin types. Sunscreens can often be greasy and too emollient for oilier skins so if you struggle in this department, I'd really suggest trying this one. I've tried many a cleansing balm in my time and if honest, there aren't too many I would choose over neat, cold-pressed, extra-virgin olive oil. Some, like the Oskia Renaissance balm, don't remove my makeup thoroughly enough and others, like the Heimish balm I'm entirely sick of the smell of. I was persuaded to pick up the Omorovicza balm and I feel like I've fallen in love. It's inoffensive, thorough and has a texture silkier than silk. I wrote about some Purlisse goodies last year and several months on, it's their serum that has stood out most. There's a lot I love, from the light texture that provides sufficient hydration, to the inclusion of lovely ingredients such as alpha arbutin for brightening, B vitamins to strengthen and avocado oil to moisturise. I have noticed some brightening effects with continuous use, less so lightening of scarring etc but an overall glow to my skin - it's a great one to apply in the mornings when you wake up looking a little dull and lacklustre. As you're probably beginning to see, I've got a bit of an affinity with lactic acid, as we talk about another skin treatment containing the ingredient. Rather than using this all over, as I find it's a little too strong for my skin, I like to focus this on 'areas of concern' like the hyperpigmentation and blemish scarring on my cheeks, and my forehead because clearly I contort my face too much with my facial expressions and that's the first area I see fine lines and an uneven skin texture. Used in this way, I really enjoy it, and although expensive, I think it's worth it's price tag. Im so envious of your skin care collection! Looks absolutely dreamy! Wow! 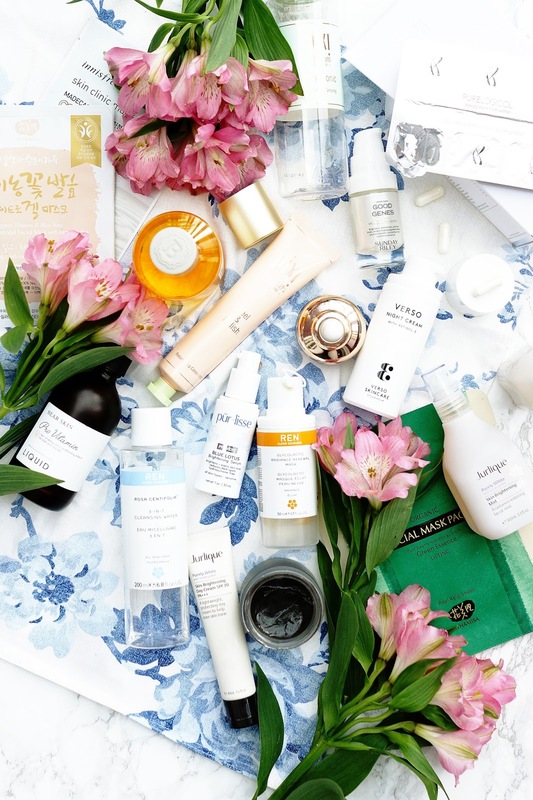 Such great recommendations... added a few of these to my skincare wish list already! So many great products here! Now that we have Pixi in Canada, I bought the glow tonic, but I'm always eyeing my next buy from them. I was thinking about buying one of their facial sprays, but the peel and polish mask looks great as well!